A while back there were reports that Sylvester Stallone’s The Expendables 2 movie was shooting for a PG-13 rating after Chuck Norris’ insistence on the matter. It should’ve been obvious that it would cause backlash — since, you know . . . the fans of the first film are the ones they’re aiming for; who just so happen to love 80s action flicks that offer violent fight sequences. Maybe that’s one of the reasons for the return aim for R? It sure should be. It would be a tad ridiculous for a movie starring Sylvester Stallone, Dolph Lundgren, Jason Statham, Bruce Willis, Arnold Schwarzenegger, Jet Li, Jean-Claude Van Damme, Terry Crews, Chuck Norris, Randy Couture and Liam Hemsworth to be rated PG-13. Just a tad. 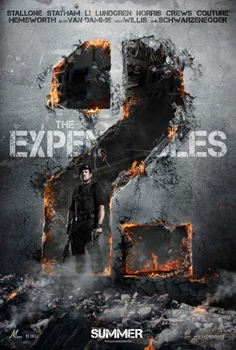 The Expendables 2 hits theaters August 17. Proof right here that not even Chuck Norris can defeat these men, especially Stallone.